This was an image from a story that I wrote and illustrated called 'How strange.' The story is about how the world and the sun have fallen out and this causes everything on earth to go wrong. Day becomes night, the sea becomes the sky etc. 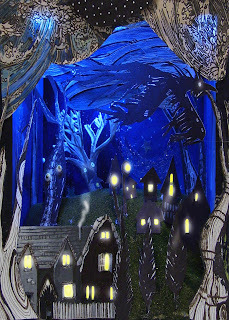 It was made from paper, wood and tiny lights then I photographed it to make it 2D.